We are confident that you will pass the certification exam after attending one of our classes. If you do not pass the first time, we will pay for your seat to attend our next training class and you will also qualify for a significantly discounted retest rate. Details - For instructor-led class registrations, valid only for FULL tuition registrations (which requires the purchase of the PFS study package) and student must attend FULL class to qualify. Late admittance will void this guarantee. Student must be registered and paid prior to exam date, does not apply to walk in registrations. In the event student does not pass the first time, retest must be taken within 3 months of ORIGINAL exam date to qualify for discounted retest rate. Reschedule fee will apply if retest date is missed. This offer is only applicable to new instructor-led registrations. This policy is subject to change without notice. We are confident that you will pass the certification exam after taking our online course. If you do not pass the first time, you may retake our online course at no additional charge (retail - $49 value). Details - For On Demand programs, guarantee valid only with purchase of certain packages (The Total Package or The Premier Package). In the event student does not pass the exam, student may re-take the online course again at no additional charge. Only applicable to new registrations. This policy is subject to change without notice. We will match pricing for any comparable/similar food safety training program. 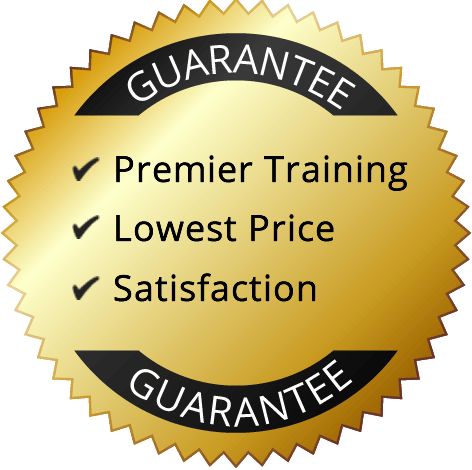 We are confident that we provide the highest quality of certification training in the industry but will even offer this value-added guarantee. Details - Services offered from competitor must include comparable services - ex. length of class instruction, comparable nationally approved exam type a) Prometric or b) ServSafe. In the event competitor services are not similar, we may match competitor service offerings and price. Customer must provide a copy of written documentation (ex. printed advertisement, flyer, website details) at time of registration to qualify for price match guarantee. We reserve the right to verify the competitor’s price before issuing price match. Only applicable to new registrations. This guarantee may not apply to private class requests. This policy is subject to change without notice. If you are not fully satisfied with the quality of our training, we will refund your money. You must notify PFS prior to taking the exam to qualify for this guarantee. Once the exam is administered, the satisfaction guarantee will no longer be valid. Valid only on full instructor-led class registrations.